The crises for the EU and the Western Alliance appear life-threatening and the struggle of survival is not going well for the advocates of the liberal Democratic ideal. 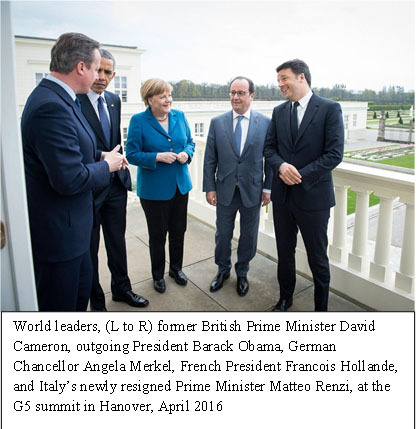 David Cameron is gone; Matteo Renzi just defeated; Francois Hollande dropped out; and Barack Obama’s term is up and legacy, including globalism, is slipping away. Only Angela Merkel is left to defend the alliance, and her hold has been weakened. After a year of political turmoil and two recent weak state election results, Angela Merkel is now politically gone and only barely hanging onto the German chancellorship. Prime Minister Theresa May, who replaced David Cameron, is unlikely to lead her party into another election, and Emmanuel Macron, the president of France, has an approval rating below 30 percent. The EU and Western alliance are even more threatened today than in 2016 in the face of President Trump and a gaggle of nationalists assuming power in Europe and around the world.